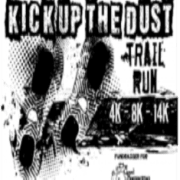 Kick it Up with the Good Samaritan Center for the 4th Annual Kick Up the Dust Trail Run. Enjoy a 4k, 8k or 14k through Choctaw Trails on Saturday, April 27th. As always, we promise a great time, good food, a great running atmosphere, all for a great cause - The Good Samaritan Center - helping families in crisis for over 40 years in the Greater Jackson Area. Online registration ends April 26th at 3pm and we will be taking day of registration for an additional $5 fee.